Lietis Rachel Reyes and Ariadna Mena, promoters of Cuba Decide traveled from the Island to Geneva to denounce the Cuban regime before the member states of the Human Rights Council of the United Nations. 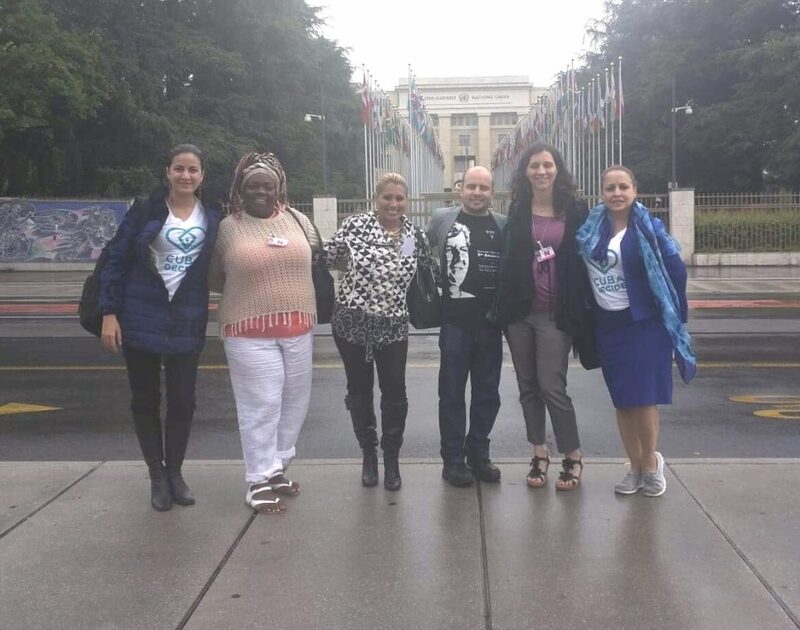 Activists of the campaign of different organizations and places of residence agreed at the Palais des Nations to make recommendations in the process of universal periodic review to which the Cuban dictatorship in the UN submitted. GENEVA, Switzerland (AFP) — Cuba faced harsh criticism at a UN review of its rights record Wednesday, with diplomats slamming repression of activists in the country, including allegedly blocking them from travelling to meetings abroad. But during the country’s so-called Universal Periodic Review (UPR) — which all 193 UN countries must undergo every four years — Cuban officials decried “manipulation” and “false allegations”. “The guarantee of the exercise of human rights is a priority,” Cuban Foreign Minister Bruno Rodriguez told the assembly. The UN human rights office voiced deep concern last week at reports that Cuba had “prevented a number of human rights defenders and civil society representatives from boarding flights to travel to meetings abroad”. It said it had received direct information about at least 14 cases, and voiced concern that the stops may be used “deliberately as a form of intimidation, pressure and harassment”. Meeting with journalists on the sidelines of Wednesday’s UPR, Rosa Maria Paya, daughter of the late opposition leader Oswaldo Paya and head of Cuba Decide, suggested the problem was much broader. “None of them can travel… Of course not all of them have tried, but all who have tried have been denied,” she said. British representative Charles Kent, who was among the 140 diplomats who took the floor Wednesday, said his country was “deeply concerned” at reports that Cuban activists “have been prevented from travelling to Geneva for the UPR”. Michelle Roublet of the United States also demanded that Cuba “release individuals who were arbitrarily detained and imprisoned for peaceful assembly, investigating and reporting on government activity or expressing political dissent”. She also urged the country to “allow them to travel freely both domestically and internationally without limitation”. Rodriguez meanwhile insisted it was the return of the US economic blockade of the communist island which “violates international law, and represents a flagrant, mass, systematic violation of the human rights of our entire nation”. But, he stressed, “in Cuba it is not possible to break with legality or try to subvert for an external regime change agenda the constitutional order and political system that Cubans have freely chosen”. “Those who act in that way do not deserve the lofty description of human rights defenders, but rather that of foreign agents,” he said. La entrada Cuba rights abuses, activist repression under fire at UN se publicó primero en Cuba Decide.